Switzerland’s Ramon Zenhaeusern, center, celebrates as Switzerland wins the team event on Tuesday at the alpine ski World Championships in Are, Sweden. ARE, Sweden – Switzerland has now won gold in all 11 events in the history of the Alpine skiing world championships. The Swiss completed their medal collection by narrowly beating rival Austria to win the team event Tuesday. Ramon Zenhausern edged Marco Schwarz in the final run as the Swiss followed up their Olympic title from last year’s Pyeongchang Games. Wendy Holdener, who won the combined on Friday, gave Switzerland its first point. The final finished 2-2 after the four parallel slalom races, with Switzerland winning thanks to a lower overall time. 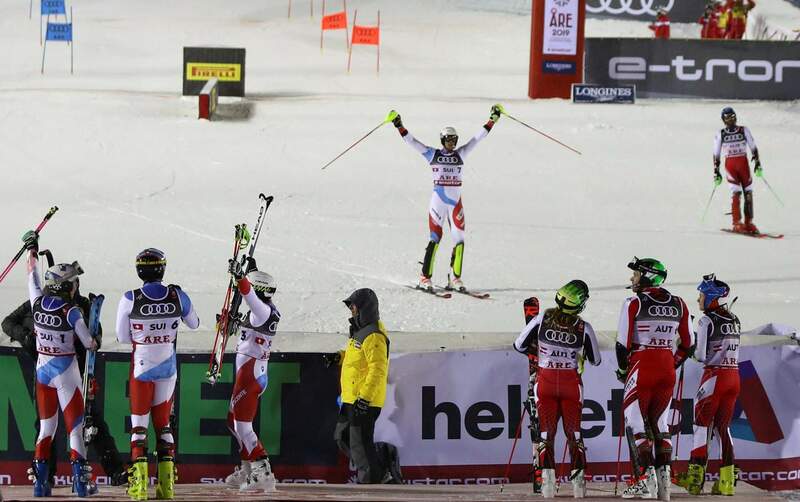 Austria is the only other nation with world titles in the five men’s races, five women’s races and the team event. Also on the winning team were Aline Danioth, Andrea Ellenberger, Sandro Simonet and Daniel Yule. Italy beat Germany to take bronze. Sixteen teams competed in the knockout format. Switzerland also beat Austria in the final in Pyeongchang. Holdener and Yule both said that team spirit was the deciding factor. “Even when we come to the city events on tour and meet up with the slalom girls we always have a game of football together or something like that,” Yule said. “So that was a really important factor today. We just had fun. Switzerland eliminated host Sweden in the quarterfinals. With Mikaela Shiffrin focused on her remaining individual events and Lindsey Vonn retiring after the downhill, the U.S. did not enter a team.